Tomorrow, the fourth edition of UK streetwear event The Reset kicks off, this time with a bit of a Carnival theme and with the addition of a ‘nightmarket’ on the Friday, where you can pick up some exclusive items as the sun sets over East London. 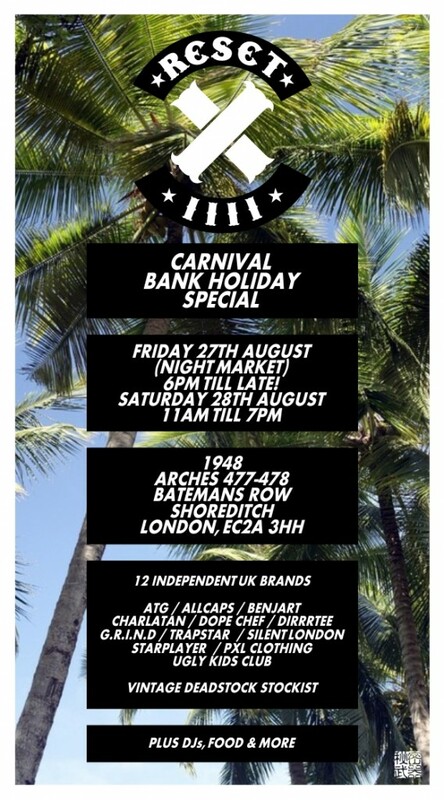 Expect to see the usual roster of UK streetwear brands showcasing their newest items, including ATG, All Caps, Benjart, Dope Chef, Trapstar, Star Player, PXL Clothing and The Ugly Kids Club. Last event’s additions Dirrrtee and G.R.I.N.D return in the company of something for the ladies with the return of the Charlatan brand after a brief hiatus, back and better than ever. Also keep an eye out for newcomer Silent London, a new brand to my attention so I’m interested to see what the brand has to say. The sale takes place at the Nike 1948 space, next to the 1948 store on Bateman’s Row. All the info you need can be found on the flyer above.